South Korea’s capital is vibrant, diverse and always worth a visit, whether it’s on a short layover or longer holidays. On optimal length for a Seoul itinerary is 5 days though of course, you can easily extend that to include even more Seoul must visit sites. Here are my personal recommendations so that when in Seoul what to visit is no longer a question. 6 Is Seoul Worth Visiting ? 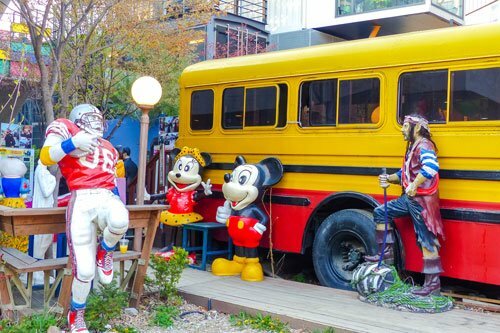 When you are on your first day in Seoul places to visit depend on whether you want to dive right into the typical Seoul sightseeing or whether you want to explore your neighbourhood. In total, there are 25 districts in Seoul, known as gu (區). These gus have quite extensive administrative powers, including their own major, council and sister cities. Plus, they are furthermore divided into neighbourhoods (dong). 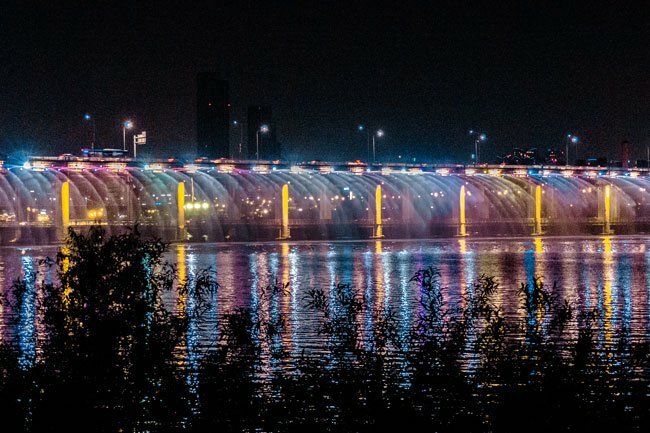 To not confuse you too much, here are the top 6 areas you need to visit in Seoul. Jongno is a must visit in Seoul. This is where you can admire a historic hanok village, palaces and temples. It is the heart of any Seoul sightseeing. Plus, it includes the Insa-dong neighbourhood with its quirky food, such as poop shaped pastries or giant soft ice cream. Hongdae is the young, hip and edgy district, where you can see shops lining out their wares along the streets. Graffitis decorate modern buildings. At night, ambitious street artists show off their singing, dancing and music playing skills. Plus, there are plenty of clubs and night bars. It’s the university district after all. Itaewon is where you can take yourself out to the restaurant scene, stock up on vintage furniture and live it up at the clubs. The best time to visit is after the sun has set. It’s then that the district really comes alive. 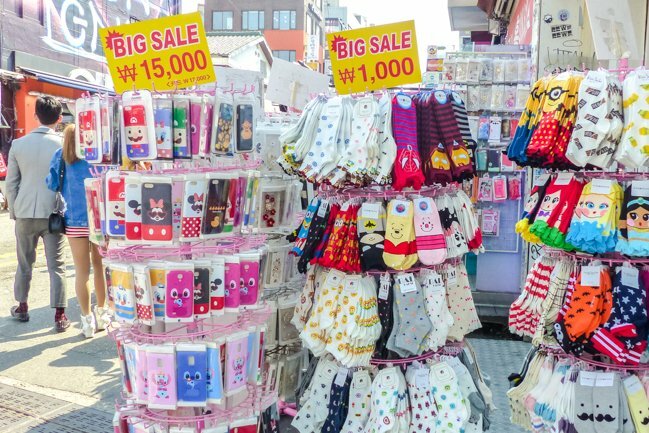 Myeongdong is perfect if you want to combine shopping with unique foodie finds. Just be warned that this Seoul district has become rather touristy and the prices match that. Gangnam is the most expensive and poshest area you can party in in Seoul. The clubs music features mainly EDM or hip-hop and locations are relatively spaced out. Since its also the richest district, you can treat yourself to a luxury shopping spree. This is where I got my hanbok rental during my Seoul visit. These palaces and temples in Seoul are all located in the Jongno district and you can easily get around by foot. Visiting even three of these must see locations in Seoul will make up an entire afternoon. So you could easily plan your whole day here. Before you call it a day, however, head to the 600-year old Bukchon Hanok Village. You can walk around freely here and admire the traditional Korean housing styles. It’s a great sunset viewing spot as well and super instagrammable! To really get the maximum out of your photos, join a guided photography tours around the village for the very best insider spots. Should you be the type to want to learn about new cultures by being hands on and crafty, sign up for local arts and crafts classes. There are around 20 workshops and studios in the area. Learn how to make hanji dolls, about natural dyeing or lacquered paintings here. Old meets new in the district of Dongdaemun. Take a short stroll up the hill in Seonggwak Park to get a good view over Heunginjimun Gate and the modern skyline of Seoul. At the gate, you can get one of the stamps need for the Wall Hike. Directions: Take the subway Line 1 or 4 to Dongdaemun Station and take exit 6 or 7. Just a little further you can find the Dongdaemun Shopping Complex if you really want that big shopping experience. For a more architecturally inclined taste, walk around (and inside) the Dongdaemun Design Plaza. This futuristic looking space is super instagrammable and currently boasts the light installation of 25,550 LED roses next to it. For more scenic walks in Dongdaemun, follow the Cheonggyecheon Stream. It flows past some of the top places to visit in Seoul. Walking here feels a little bit like removing yourself from the always buzzing streets and stepping into a calmer vibe. It’s a perfect picnic spot, too. For lunch, there is no better way than to mix and match your very own Korean BBQ. Pick whatever tickles your fancy on the markets at Dongdaemun Market (Tongdaemun). How about sizzling Korean pancakes made with kimchi, a milky rice drink or bubbling tteokbokki? If you are lucky, you may find the charming elderly lady who loves to feed her customers. She’s always smiling and you can see her newspaper clips attached to the side of her stall in which she is also feeding customers. Try Korea’s answer to sushi, gimpab, or the classic Korean odeng (fried sliced fish on a stick). Alternatively, you can combine street food sampling AND a Korean cooking class in Dongdaemun. There are daily classes on a variety of dishes, such as Bulgogi, Tteokboki, Bibimbap or desserts. Of course, Dongdaemun Market doesn’t just offer food, you gotta check out the clothing options as well. It’s all super affordable though don’t expect any big brands. I love just strolling through the market and people watch. Hongdae is also known as Hongik University Street and needs to be experienced both during the day and at night. Therefore, why not check it out in the late afternoon for some light shopping? You can get super print socks, snapbacks, one size dresses and cute jewellery. It’s like a treasure trove of cute clothing! Just be warned: many of the smaller shops didn’t allow me to try on clothing. Directions: Take the subway line 2 to Hongik University Station and take exit 8 or 9. 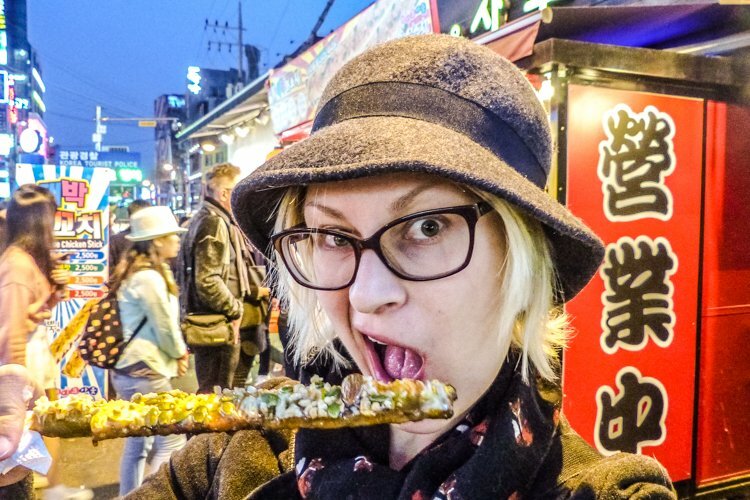 While you are stocking up your shopping bags, you can sample the amazing Korean street food. There are super ,long spicy chicken skewers, super long waffles and the divine filled pastries called hotteok. For dinner, seat yourself in one of the local restaurants for that authentic Korean cuisine. Read more: What non spicy Korean food to try. At night, you gotta return to the streets of Hongdae and admire the skills of local artists, dancers and wannabe idols. You will find singer songwriters pouring their hearts out to the tunes of a solo guitar. Then, there are perfectly in sync dance groups and occasionally there are commercial shoots taking place. Be on the lookout! While there is tons to do in Seoul, you can also venture a bit further outside for an amazing day trip. Since I don’t know your preferences, here are a few options to get you inspired for places to visit near Seoul. Are you into K Pop? Then you can’t miss Korea’s first hallyu theme park called MBC World. You might not meet your favourite idols but you can get pretty close to their holograms at hologram K-pop concerts, virtual reality drama sets and much more from ‘s major broadcasting company MBC. You can even try your hand at singing and dancing on set yourself. Here’s a fun idea, why not play a (fake) part in the TV series “We Got Married”? After you’re done you can buy exclusive merch in the onsite shop to take home with you. Get your advance ticket to avoid going on a booked out date. 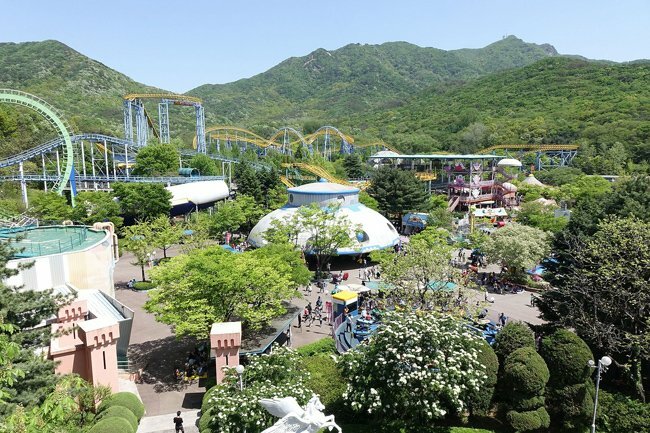 To truly feel like you’ve entered a dream land (or the set of a Korean drama), plan a day trip to Garden of Morning Calm, Nami Island and Petite France. The Garden of Morning Calm (아침고요수목원) is particularly pretty in autumn and spring when the colours explode and the Festival of Chrysanthemums and Autumnal Tints as well as Spring Garden Festival are held respectively. In summer, you can attend the Festival of Roses, Hydrangeas and Roses of Sharon. In winter, light installations take the place of flowers. 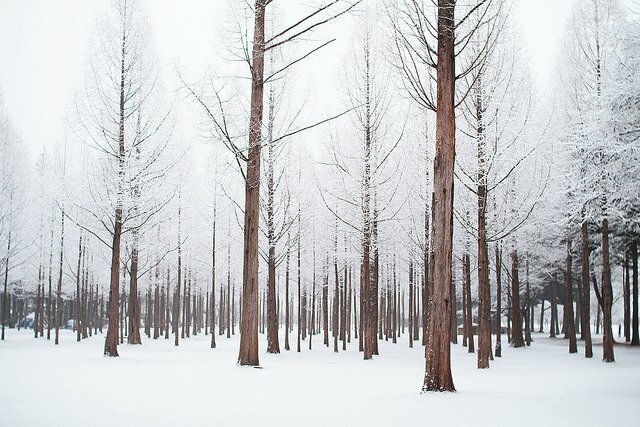 Also known as Nami Island, Namiseom (남이섬) isn’t an entirely natural island. It was formed as a result of the damming of Cheongpyeong Lake. What makes the island so visually striking are its tree lined roads. Fun fact: To preserve the untouched nature look, all telephone poles run underground. Those interested in history might want to visit the grave of General Nami, who defeated the rebels threatening the Joseon Dynasty in the 13th century. Petite France (쁘띠프랑스) was inspired by flowers, stars, and the Little Prince. You know, that famous children’s book from Saint-Exupéry. The little theme park looks a pastel coloured dream of quintessential European flair. You can even stay in the 16 French-style buildings to really get an immersive feeling (or stay close by). One of my favourite day trips from Seoul was to Seoraksan National Park near the fishing town Sokcho. 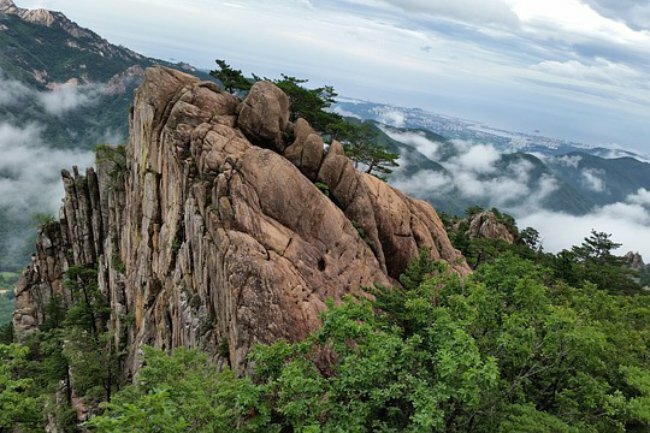 Mount Seoraksan is the third tallest mountain in Korea and offers marvellous views. You can master various hiking trails, see waterfalls, gaze at the giant Buddha of Shinheungsa Temple, or take the gondola up to Gwongeumseong Fortress. Getting there by public bus took up a few hours, so if you want to maximise your short time and don’t want to figure out how to communicate with the ticket vendor (I had a hard time), I recommend booking a tour. Are you into theme parks? Here’s another one to excite the inner child within you. Despite being called Seoulland, this fun place has also dedicated itself to showcasing cultures and architecture around the world Head to World Square to see it. Other than that, enjoy over 40 rollercoasters, evening laser shows and merry-go-rounds. Skip the waiting time in queues and get your UNESCO site as it used to be ticket online. 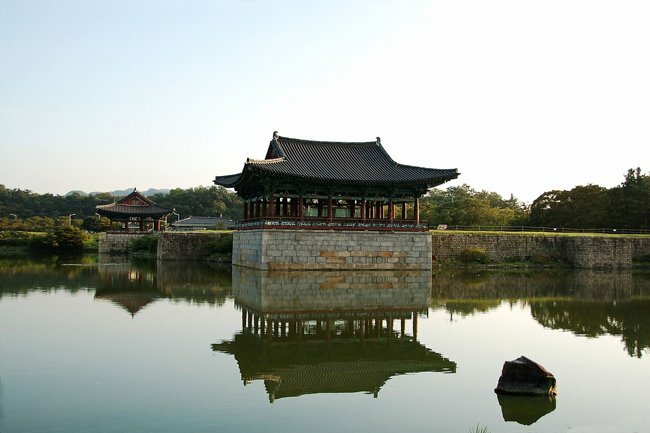 The Gyeongju is a UNESCO site as it used to be the capital city of the ancient Silla Kingdom (57 BC-AD 935). Inside this wonderful “outdoor museum” you can visit five section, including the ulguksa Temple, Buddhist relics, ancient tombs, Myeonghwalsanseong Fortress and the oldest astronomical observatory in Asia. To really make the most of your visit and hear about its impressive past, interpret the ruins and actually find your way here, book a tour. They can be quite popular, so it’s better to sort it out in advance. Last but not least, you might be interested in seeing South Korea’s neighbour. Getting to North Korea is not the easiest feat and what do you actually see up there? It’s all very strictly controlled and supervised. 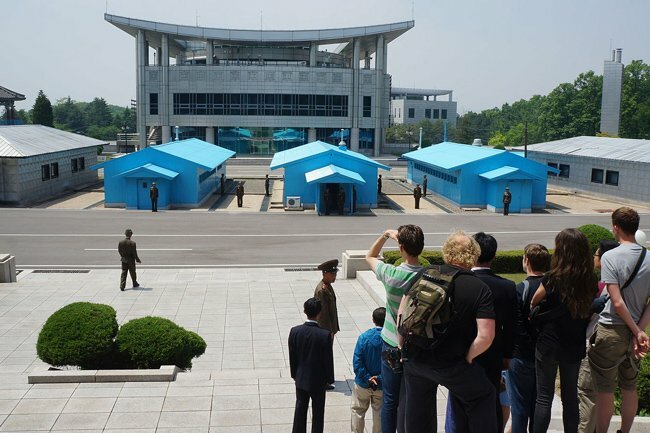 If you want to learn more about the North and South Korea conflict but aren’t keen on the DMZ (or want to compliment the tour), why not head over to Paju? It is situated south of Panmunjeom and pretty close to the North Korean border. You can visit the Imjingak Korean War monuments & sculptures, check out the Dora Observatory post overlooking North Korea as well asthe Odusan Reunification Observatory near Paju. One place I particularly loved (and was a little creeped out by) was Heyri Art Village. This is a unique place in which local artists have set up residency, create and sell their art. It looks staight out of a comic. Don’t be surprised to find a smurf house on the roof, utesy heads stacked on top of each other and swan boats standing next to a pond. It’s bizarre to say the least. Not sure how fit you are but it’s entirely possible to do the entire Seoul Wall Hike in one day. But you have to start super early, march on relentlessly and have your lunch parcel and water bottles ready to go. 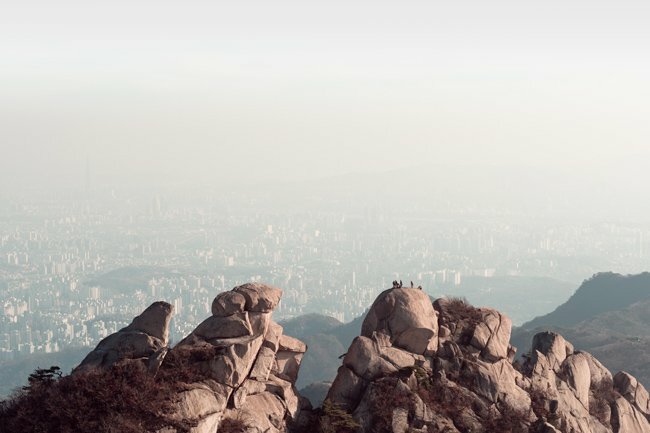 It’s strenuous as you constantly have to climb small mountains and hills and then dip down again into Seoul’s city life. I managed to hike about 80% of the hike during my visit to Seoul, starting below Namsan hill and going all the way to Dongdaemun. If you copy that route, you can have your first morning snack at Namsan Seoul Tower (남산서울타워). There is a restaurant and shop up here in case you need to replenish your snack and water supply. They have tourist prices, however. Better wait until you are on the streets again and head to a 7Eleven. Read more about the Seoul wall hike route and stops. In case you do end up at Dongdaemun, I recommendtrying Korean dishes you haven’t had a chance to sample yet. This time, however, stop by Dongdaemun Night Market (Sebit Market). You can find the rows of yellow tents right behind the Design Plaza. It’s open from 11PM to 3AM every day except Saturday. To take it slow, an option is to visit Seoul’s many museums. Depending on your inclination, choose between art museums, history museums or quirky museums. Seoul’s art museums include the National Museum of Modern and Contemporary Art, Seoul Museum of Art Nam-seoul, Daelim Museum of Contemporary Art, D Museum and Hangaram Art Museum. Seoul’s history museums include the Seoul Museum of History, National Museum of Korean Contemporary History, Seodaemun Museum of Natural History and of course the The National Folk Museum of Korea. Unique museums in Seoul are Trick Eye Museum, Toto’s Nostalgia Museum, Museum of Chicken Art, Kimchi Museum or the somewhat farther out Toilet Culture Park & Museum. After a long day of hiking, you really need to take care of your aching body (especially if you don’t hike regularly). What better way than to try the Korean version of a spa and sauna? Jjimjilbangs can be found in various places in Seoul and are quite the experience. Like with Japanese onsen, you have to strip down completely naked. The sauna is gender segregated, so it’s a little less awkward. In a jjimjilbang, you can find hot tubs, saunas, and massage tables. You can pretty much spend a good chunk of time getting pampered here. Plus, there are unisex lounging rooms, where you can watch TV, lay down for a nap or exercise. Here, you wear simple spa clothes, of course. A great place to get started is Itaewon Land. On five floors you can fully relax in various heating rooms, such as pine, salt, red clay or flat stone room. If you cannot be bother to leave, stay overnight before your flight leaves. In case you need to catch an early flight and need to leave Seoul without changing metro lines, pick Siloam Sauna. It allows affordable stays, is right next to Seoul station and include a laid back jjimjilbang. The sauna is fed by water coming from 300 metres below and has great healing qualities. It’s your last day in Seoul and by now you might have already gotten all your travel souvenirs. However, if you still have space and love shopping, Myeongdong is the place to be. Alternatively, you can invest a few coins in 32cm long ice cream, cuddle up with felines at a cat café or just stock up on Korean beauty products, such as snail essence lotions, facial masks and adorable lip glosses. Seoul is great in any season. However, some key considerations for Seoul’s best time to visit are temperatures, flowering times, festivals as well as typical smog levels. It’s not much fun when you can’t really go outside with or without a mask and everything is just a little too fogged up. Seoul has quite varying temperatures throughout the year. Both spring and autumn are pleasant with sunny days. But they don’t stick around too long. Spring flowers and autumn leaves disappear quickly. Summers in Seoul are warm and humid, so the 23°C to 30°C (73.4-86°F) feel quite hot. Especially the glass and steel buildings and concrete streets will reflect the sunlight. Winters in contrast are long, cold and luckily dry with temperatures between -5°C and – 2.5°C (23°-7,5°F). However, you should also consult current pollution levels before visiting Seoul. 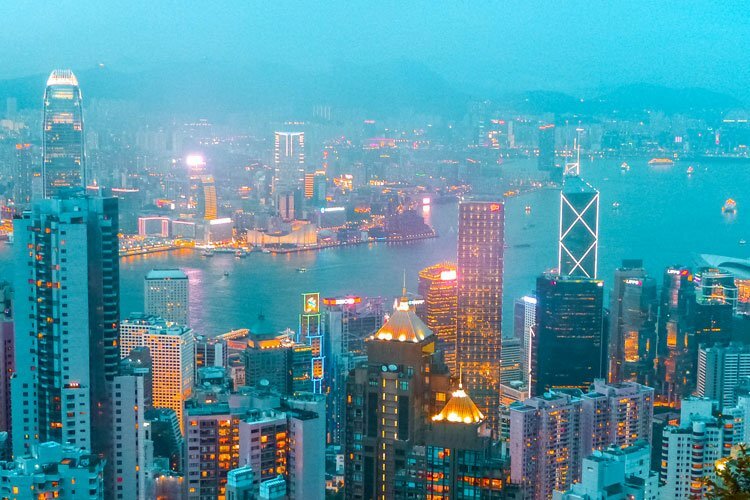 In winter and spring, smog levels can be nasty. You’ll see it in the yellow dust (HwangSa) that permeates the air. Spring is a great time to visit thanks to the many cherry blossom festivals in Seoul. However, there are tons of other Korean flower festivals you shouldn’t forget just because cherry blossoms (벚꽃) are super popular. How about the bright yellow dogwood tree? Celebrate it in the last two weeks of March. When you do the wall hike around Seoul, you will most likely discover plenty of azalea (진달래) hedges. Those flowers are also revered in Korea. Other Korean spring flowers include tulips, plum (매화), forsythia (개나리), magnolia (목련) and rapeseed (유채꽃). In summer, you really have to get outside and enjoy the various parks, street food stalls and riverside of the city. Why not combine all three of them? However, that being said, and in case you are a K Pop fan, attend a concert! There are tons going on all the time, so why not grab a ticket? Afterwards, you can enjoy the neon lights of the city from various vantage points, sun as Namsan Tower. With Seoul being nestled among scenic mountains you will undoubtedly be treated to wonderful autumn colours. Visit the gardens of the temples and palaces to really get the full colour range. Pro tip: Wear a hanbok to get free access. Winter isn’t a time for warm days but you can get warm and fuzzy feelings with wonderful light installations. Try the artificial rose garden installation on Dongdaemun Design Plaza for starters. It will be freely accessible until December 2020, when it might be taken down. I personally enjoyed staying in different districts to get a real feel for their differences. My main two favourites were Hongdae and Itaewon. Both are so different from one another. The first is playful and full of amazing street food. The second is fancy and has amazing, diverse restaurants. 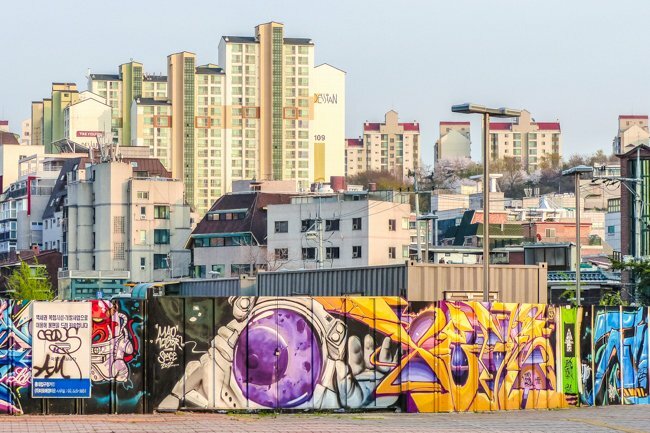 Read next: Which Seoul district is made for you? Generally no matter in which district you are staying, close or further from Seoul’s city centre, you can easily get around by metro. Everything is well connected. Backpackers will love hearing that Seoul in South Korea is great for low budget stays. There are plenty of budget hostels around. I stayed in hostels both in Hongdae and Itaewon. To be fair, some of them are hit and miss, so better check only reviews carefully. As a rule of thumb, hostels in Seoul are rather crammed and not the newest. So don’t have high expectations. 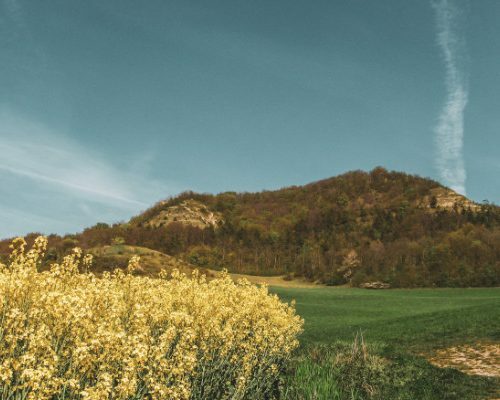 Should you place importance on the look and feel of a hostel, then book yourself into a private room or the female dorm at Whitetail Backpacker & HostelCheck availability here. For an even more stylish hostel experience, you gotta check into Hostel Haru, which is tastefully minimalist in style. It feels almost futuristic. I love it when hostels provide curtains, lights and storage lockers, and you can find that at Itaewon N Guest House. It is a constantly high rated hostel in Seoul, according to booking.com. Do you like clean wooden interior design? Then Rian Hotel will be right up your valley. It’s like the 70s got a hip modern update. Enjoy the complimentary American breakfast, comfortable beds and ensuite bathroom. The main attractions of Jonson are just 20 minutes by foot. G2 Hotel Myeongdong is a little bit more on the pricier side but gosh those rooftop views are amazing! You can sip your cocktail and gaze out at the sparkling Seoul Tower at night. The area around the hotel is particularly ideal if you want to shop for Korean cosmetic articles and designers. To really feel at home in Seoul, I recommend booking a local apartment. But not just any apartment. How about the uber stylish and sleek Orakai Insadong suites right in the middle of the action? The self-catering apartments here are incredibly spacious and even come with access to an inhouse swimming pool, fitness centre and sauna. Did you know that Korea’s tallest building includes a hotel? To get absolutely breathtaking views over Seoul’s skyline, check yourself into floor floors 76 or 101 at Signiel Seoul. I mean, the rooms are absolutely stunning AND there’s a champagne bar, Michelin-starred restaurant, swimming pool, fitness centre and banquet facilities in the hotel as well. The metro station is also part of the building. Talk about luxury. Speaking of luxury, the Four Seasons are a guarantee for an epic stay. (Check if there is a current deal on booking now). The Four Seasons Hotel Seoul is only a 10 minute walk away from the main places you must visit in Seoul! And if you just want to watch the world pass by below, enjoy the floor-to-ceiling windows of your room. Heck, just order the 24 hour room service while you’re at it. Seoul is super well connected with an extensive metro system and it is brilliant. You can get around to all the main sights in the big city easily, fast and in an affordable way. You can get single tickets (which will be reclaimed after and reused) or top up cards. You can, of course rent a car and drive around Seoul but you’d actually be faster and would find your way around easier if you stuck to the metro. To head out of town, there are regular trains and buses available. Walking also is a very possible thing to do. While Seoul is a rather large city, the centre is very walkable, the main sights are close by. If you end up doing the famous Seoul Wall Hike, you will be on your feet anyway. From Incheon Airport there is the A’REX rail link to get into town or to Gimpo Airport. Both the express and commuter services to Seoul take roughly an hour. From Gimpo Airport , you can take subway line 5 for a little under an hour to the city centre of Seoul. Alternatively, you can hop on the bus to Seoul. One option are limousine buses that take you to your hotel for around 14,000 WON ($13). Should you want a super hassle free transfer, book in advance so it’s already waiting for you. Local buses cost 8,000 WON ($7). Ask the local vendors for the best stop near your accommodation. Taxis can be quite costly with prices between 40K and 60K WON ($36-54). Look out for the regular (grey) or deluxe (black) taxis. Fares include the highway toll (6,900 WON/$6) the time it takes to get to your destination, so better not take the taxi during rush hour. Travel insurance – Wherever you go and for whatever duration, you need travel insurance. Not only are any possible medical emergencies covered but also lost/stolen luggage, extensive flight delays and other unforeseen unfortunate events. It’s better to be safe than sorry because costs can easily pile up when things go wrong and this way you might pay out of pocket but can reclaim the expenses later. 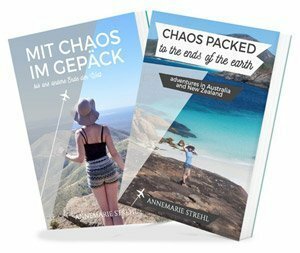 (I know what I’m talking about, I wrote an entire book about my (mis) adventures in Oceania. Travel guides – To get a great overview of cool areas, both touristy and off-the-beaten track as well as insider tips on restaurants and museums, get a guide book. 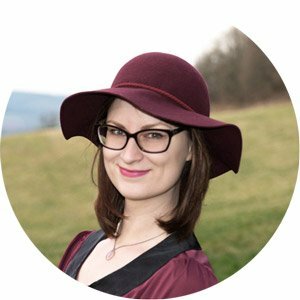 I can only cover so much in a blog post. And Lonely Planet is definitely the master when it comes to extensive guide books. External battery – I seriously test my phone battery whenever I do full on sightseeing tours. I mean, there are so many great places in Seoul to visit, and I don’t know about you, but I take tons of pictures. I also use my GEO tagging to find my way around faster. Therefore, I always carry my little blue external battery and charging cable, which allows me over one full charge and that’s all I need. Snapback – Let me tell you, I don’t typically dress in a hip hop kinda style but walking through the streets of Seoul makes me want to wear Americanised fashion with a cute spin. I mean, you’ll probably gonna stock up on cut new things but if you aren’t petite that might be tricky. So get your faves with you to immediately feel “Seoul-linised”. Wifi hotspot – Seoul is great in that is has plenty of public wifi hotspots. But when you head away from the city centre, such as on day trips or on your city wall hike, you might need some portable Wifi. I always travel with my Skyroam rechargeable device, which works in dozens of countries around the world. If you don’t travel too often, get a Korean sim card with 4G LTE Unlimited Data, which you can order online and pick up upon arriving at the airport. Is Seoul Worth Visiting ? Is this even a real question after all these amazing sites? There are seemingly never ending must visit places in Seoul both for cultural connoisseurs, foodies and history nerds. Find nature next to old and modern buildings, festivals and concerts happening and impressive night views. Seoul is always a great idea for a visit, no matter if your Seoul itinerary is for 5 days, 3 days, more or less. It’s easy to get around, affordable and even on a short layover, totally packs a punch. I hope this Seoul visitors guide was helpful to you. Don’t shy away from asking further questions or giving your own suggestions for things to do in Seoul. Tell me, which day would be your Seoul highlight?